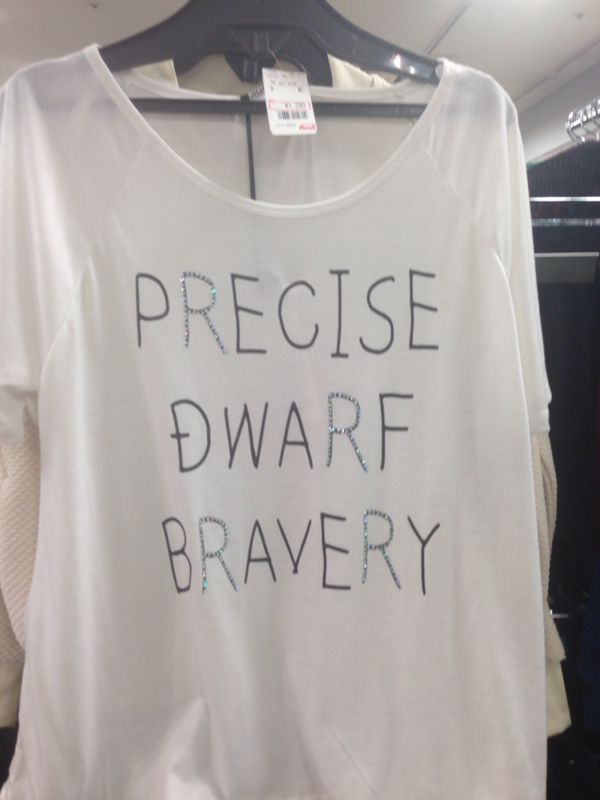 I have seen the phrase "dwarf bravery" on japanese shirts a lot. What the hell concept is being mistranslated here? Does whatever japanese word or words this originates from have a real english equivalent? 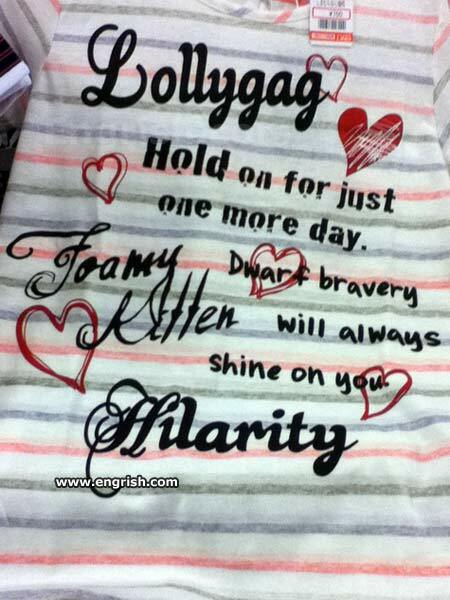 It's a mistake to assume that the English text on these shirts has any Japanese antecedent. The words are probably strung together more for how they look as abstract shapes than for any other reason. I suspect that all the different shirts that mention "dwarf bravery" and "exhilarate kitten" are from the same manufacturer, recycling the same stock of nonsense phrases. One thing to consider: you may be seeing this specific phrase, odd as it is, because it's part of a branding effort. Early in my time in Korea, I couldn't stop seeing the word 'justifiable' written on shirts. While it was initially confusing, I eventually discovered that Polham the Justifiable was actually a line of clothing. It makes more sense with context. Wild guess, but it might have originated as an odd translation of a Japanese phrase with a similar meaning to Shakespeare's "Though she be but little, she is fierce!" Japanese use of English phrases often makes no sense at all to English speakers. There's a large and successful line of soft drinks called "Pocari Sweat", for reasons which are totally opaque to us. Re: Pocari Sweat - the reasons are pretty transparent, it's an electrolyte drink to replace what you lose while sweating. While I can't definitively answer, I have to take exception to the idea that words are just chosen at random for how they look. There are definite themes that run through clothes (cheer, strawberries, excitement, kittens, adventure, friends, summer). You don't see lots of shirts that say "envelope furnace peripheral knave". That said, this one is a stumper. My guess is that it's a kanji-for-kanji translation of "小勇", which apparently is "brute courage", as opposed to "大勇", which is "real courage". However, that's not a common word (I have never seen it before). There's another big possibility, which this image brings to mind. At the top right is "Take good care of uterus". I'm almost positive that this is from auto-translating a typo. "Take good care of the earth" would be "cikyu wo taisetu ni suru". Typing "sikyu" instead of "cikyu" would result in "take good care of uterus". 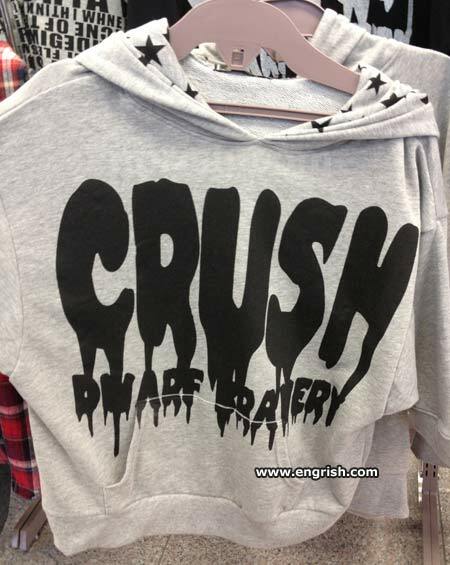 So what seems highly likely to me is that someone entered a bunch of Japanese words that had the right "feel" for the brand (like 活気 (exhilirate), 子猫 (kitten), and the like), but there was a typo in one of the words, turning it into something which got auto-translated into "dwarf bravery". And once the English list was made, it got used in design after design by that company, thus appearing on a bunch of different clothes.